Since the first EVECCS Congress in Lyon in 2004, the annual EVECCS Congress has grown steadily and developed a reputation for high quality CPD in the field of ECC coupled with an exciting social programme and the opportunity to meet with great friends and colleagues from across Europe. From 2016 and onward the congress will be a joint venture of EVECCS and ECVECC and the new name will be EVECC Congress. It is now a full 3 days congress, with 3 parallel streams. The lecture programme includes a refresher stream, with practical topics of use to the general practitioner with an interest in ECC, an advanced stream talking about high level updates on the latest advances in ECC in the human and veterinary fields, and a nurse stream, specifically dedicated for Veterinary Nurses and Technician. Since 2004, there have been over 50 speakers from both Europe and the USA. Speakers are invited on the basis that they are clinical and scientific leaders in the field but also as they are excellent communicators. Notably, the importance of nursing staff in providing high quality emergency care is recognized with specific nursing experts being invited to speak on several occasions. High level research abstracts and posters are presented each year during Congress, with great awards for every winners. Additionally associated with Congress there are practical wet and dry labs led by experienced facilitators. Topics that have been covered include ICU techniques, CPCR, FAST ultrasound in the ER and cytology for the ER. Last year a very successful congress was organized by Linda Perissinotto and her team in Venice, Italy. All participants had a very rewarding time and enjoyed excellent lectures and a great social program. 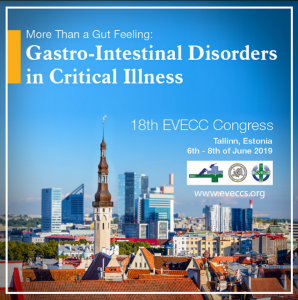 Now the responsibility of organizing the 2019 EVECC Congress has passed to the Local Organizing Committee chair Heli Säre and her team in Tallinn, Estonia. For more information please follow this link to the congress website.